Pan-African cuisine takes center stage at the chef's new Manhattan restaurant. It was all a dream, I used to read Word Up! magazine//Salt-n-Pepa and Heavy D up in the limousine... The notorious lyrics from Biggie's "Juicy" escape the speakers of Henry, the 75-seat restaurant revived by chef Joseph "JJ" Johnson. Located inside the LIFE Hotel, the curated playlist of hip-hop music is the first course of a dining experience here, and a large part of Johnson's ethos. "When I think of who is often cooking in the kitchens of our industry, it's people of color," he comments. "The music of the 90s made African-Americans feel comfortable with themselves and what they looked like, and I'm simply celebrating that." If Mase, Diddy and Cam'ron illustrated the Harlem music scene of that era, then Johnson is doing the same with food to showcase the journey of Pan-African cuisine from uptown to the NoMad neighborhood of Manhattan. "I started doing my own research on the LIFE Headquarters and learned that it embodied such a prominence in New York City history," explains Johnson. "It was a place on the pulse of the latest news, trends and cutting-edge information." It's with this logic that Johnson uses Pan-African cuisine to fulfill the natural movement of how people are traveling and eating. During his time at NoLita's Chefs Club, Johnson found that guests who resided downtown, Brooklyn and Queens craved globally-inspired cuisine from the diaspora, albeit in close proximity to their homes. With LIFE's central location, Johnson will lead that narrative. Con'con features jollof sticky rice with eggplant curry and cilantro. At Henry, guests can find elements of Johnson's childhood on the menu. Piri piri clams lightly fried in rice flour are a nod to the first time he tried a raw clam topped with Tabasco and savored with his uncle on a beautiful July day. Another homage to home found on the menu is the con'con—the rebellious sister to white rice that is found burnt at the bottom of his grandmother's pan—served with an eggplant curry and brightened with cilantro. 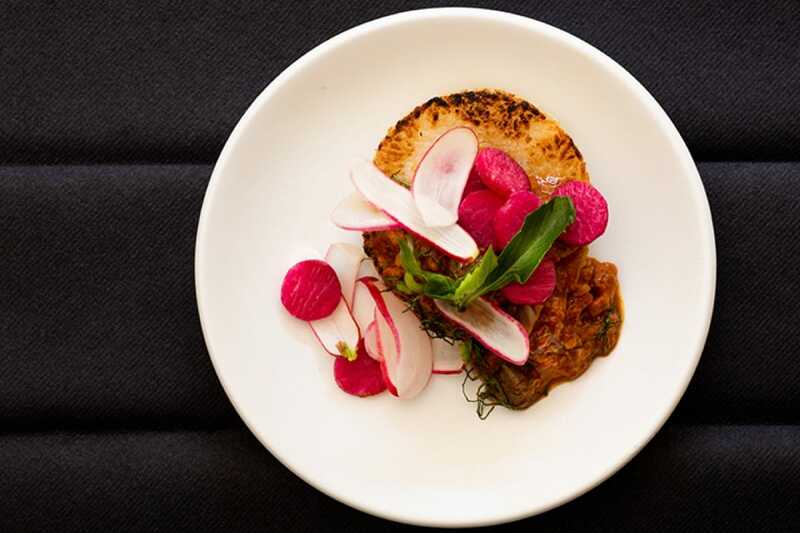 Excited by peanut’s role in Pan-African food, Johnson includes it in a kohlrabi dish served with a West African peanut sauce known as mafé alongside blueberries and tangy sorrel. Alongside flavors traceable to the Caribbean, Africa and Latin America is a cocktail program spearheaded by Pam Wiznitzer. "Through my years of cooking, I've found that people still think wine first when it comes to drinking during a dining experience," Johnson comments. "For the style of food at Henry, cocktails are a great opportunity to use the ingredients of the cuisine and directly reflect them in the drinks." Behind the stick, Wiznitzer incorporates the plantain found in the purée that accompanies the half jerk barbecue chicken into a simple syrup found in the Wait Wait, a bourbon-based cocktail balanced with ginger, lemon and bitters. 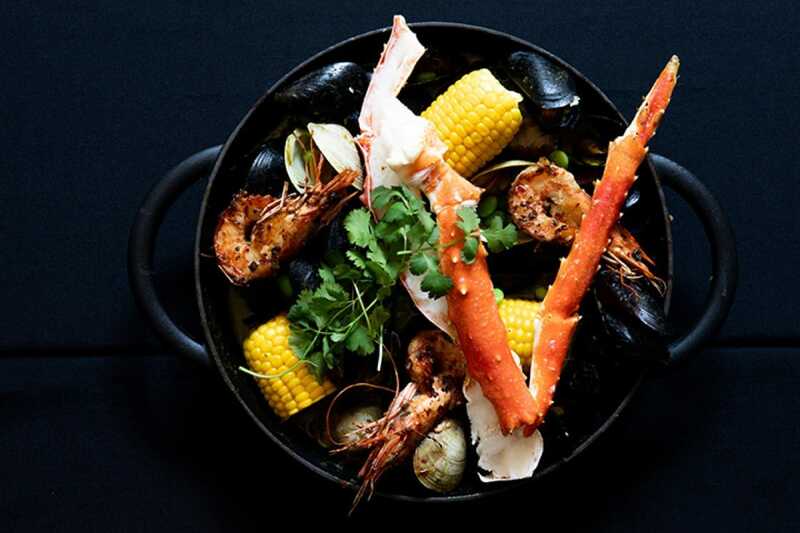 The Afropot features king crab, prawns, corn, clams, mussels and Chinese pork sausage. In an effort to enhance diversity in his cuisine, Johnson, in collaboration with Craveable Hospitality, made it a point to fill his staff inclusively and equitably. 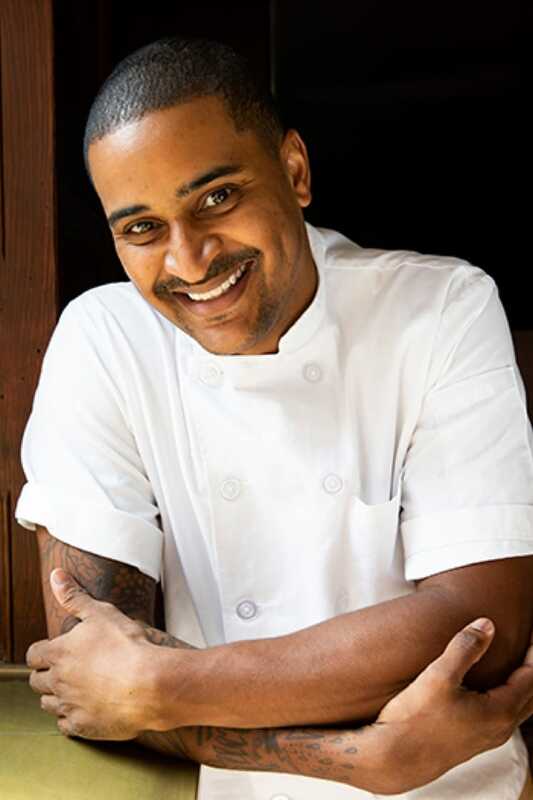 Samantha Davis, Henry's chef de cuisine, and sous chef Omar Tate are a black woman and man, respectively; the pastry chef, Zac Young, is a member of the LGBTQ community; the bartenders have English as a second language; and Tibetan, Japanese and French can be heard spoken amongst those in the kitchen. "My M.O. is to hire the best person for the job, and many times that happens to be a person from a minority community," Johnson notes. 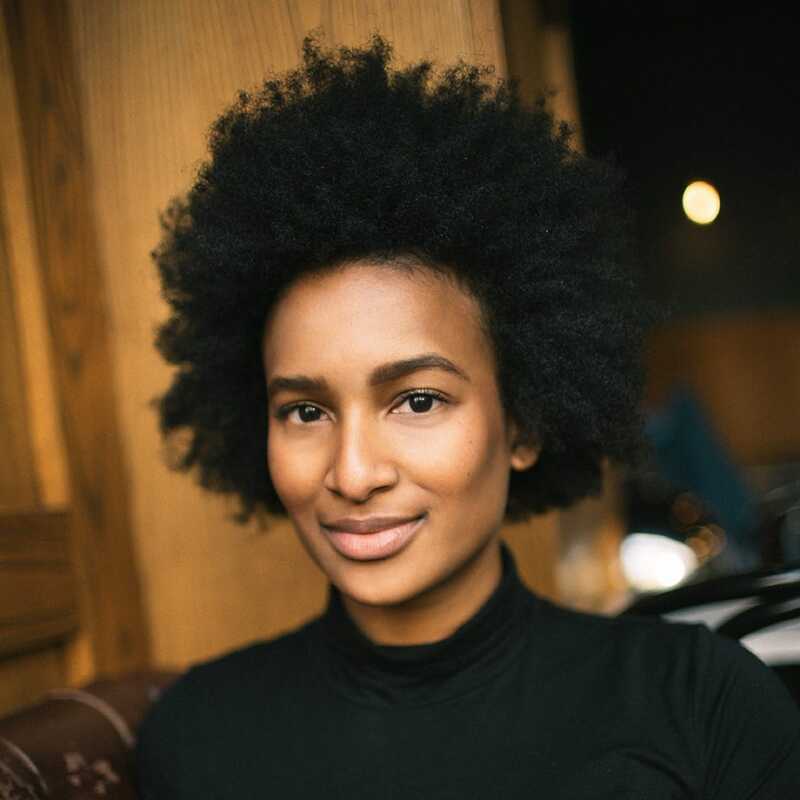 "When you spearhead the opportunity for all to advance in this industry, your kitchen, the food that comes from it and the entire experience is advanced because diverse perspectives only add to the story we're aiming to tell." "The neon 'JJ' is like the bat signal in the sky—when it lights up, you know that good things are to come." 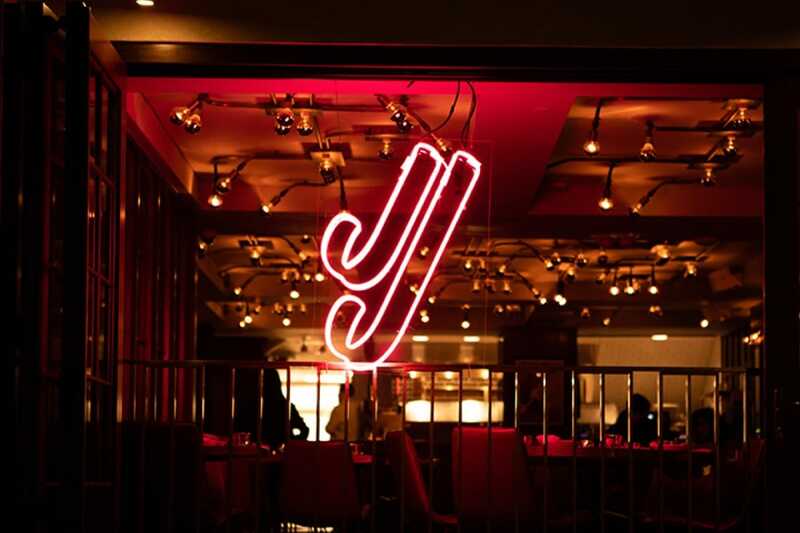 Fluorescent pink light illuminates the letters "JJ" that face the street to the right of the Henry’s entrance, just as it did at during Johnson's residency at Chefs Club. "I read this Bloomberg article that said that pink neon just does it for people," chuckles Johnson. "It's not my style to name a restaurant after myself, but the neon 'JJ' is like the bat signal in the sky—when it lights up, you know that good things are to come." Photos by Bea da Costa.